When I think of guitars, I can&apos;t help but think of my dad. Seldom does a family outing go by without my dad breaking out his guitar for an impromptu jam session. And when Sunday rolled around growing up, I often found myself waking to my dad singing and playing his guitar while preparing for church service. So, when I heard the Hendricks County 4-H Fairgrounds & Conference Complex in Danville, Indiana, would host The Indiana Guitar Show from 11 a.m. to 4 p.m. on Sunday, April 14, I, of course, thought of my dad. 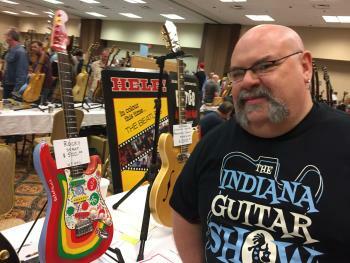 Memories, like mine, and diehard musicians, like my dad, have allowed The Indiana Guitar Show to prosper now for 30 years. The show has gone through many iterations and organizers during that time, but is as strong today as ever. In fact, the show first came to Hendricks County last year after it had outgrown its previous space. When the show&apos;s current organizer, Eddie Prather saw the 18,000 square feet of space at the fairgrounds complex in Danville, he found what he hopes to be the show&apos;s permanent home. 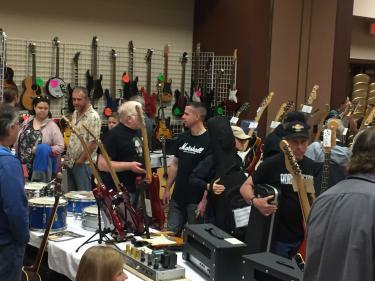 The event showcases about 75 dealers from as far away as Arizona, Georgia and New York and more than 150 tables featuring various musical instruments and accessories. Visitors will find much more than just guitars. PA systems, fiddles, dulcimers, recording equipment, vinyl records, mandolins, amps, vintage equipment and much more will be available for purchase at varying price points. He added that more than half of the dealers aren&apos;t commercial retailers either. "They are just guys, musicians, that have accumulated a lot of things and have a passion for this and can&apos;t wait each year to be a part of the biggest musical event of the year in Central Indiana." 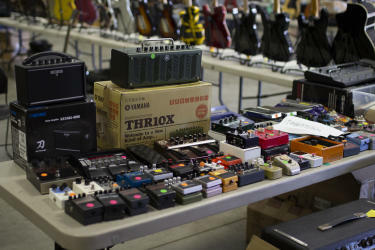 Every dealer will have a lot of cash on hand, so Prather encourages anyone who has a musical instrument just sitting around the house to bring it in because they will probably find a buyer. He cautions not to take the first deal, but to move around the room and find the best offer. Buying, selling and trading is encouraged at the show. And a silent auction will close out the event during the final hour featuring autograph memorabilia from Paul McCartney, Tom Petty and other legendary musicians. Visitors should stick around for the auction as Prather expects some great items and great deals. New this year, the Dizzy Izzy&apos;s Food Truck will be onsite providing sandwiches, sides and drinks. Admission to the show is $8 a person at the door. Visitors can opt to buy this year&apos;s event T-shirt for $20, and the admission fee is waived. Parking is free. And, yes I did tell my dad about the show, and he and two of his buddies plan to come from Illinois to check it out. If you or anyone you know loves musical instruments, follow my lead and invite them or just come see it for yourself. Where: Hendricks County 4-H Fairgrounds & Conference Complex, 1900 E. Main St., Danville, Indiana. Cost: $8 a person, but parking is free.